Our short vacation to Ukraine is now over. Ryan’s Mom and Fred visited my parents in Kiev and of course we came along. 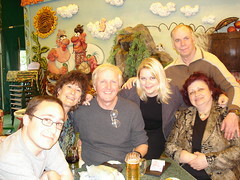 I think both families enjoyed the time spent together very much. Click here if you have time to view a couple hundred pictures. Just a quick update from my Mom and Fred’s visit. 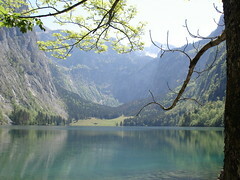 We had a really nice trip to Germany, to Königssee. It was really a beautiful place, and we got there just in time for the 1st of May, and all the maypole celebrations going on. Everyone was in their traditional garb of lederhosen and was completely getting drunk. 🙂 So we joined in, and watched everyone going crazy. We also took a really nice ride around the lake on a boat, and I tasted some freshly-smoked trout. Overall, a great time!